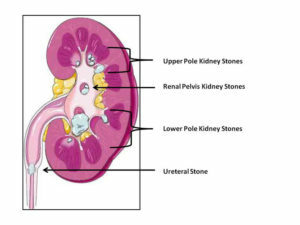 Kidney stones are hard masses that form from concentrated crystals found in the urine. Normally the substances that make up kidney stones are dilute in the urine. When the urine is concentrated, these substances clump together and form a nidus for kidney stone formation or nephrolithiasis. The urine contains chemicals that inhibit and promote nephrolithiasis. In some patients the balance between these chemicals is off and stones develop. The majority of kidney stones contain calcium but there are several types of stones. Stones are classified into two major groups, those that are radio-opaque (visible on a standard x-ray) and those that are radiolucent (not visible on a standard x-ray, only visible on computerized tomography [CT] Scan). Radio-opaque stones include Calcium Oxalate (monohydrate and dihydrate), Calcium Phosphate and Struvite stones. Radiolucent stones include Uric Acid, 2,8-Dihydroxyadenine, Triamterene and Xanthine stones. Kidney stones typically form and rest in the kidney for long periods of time. 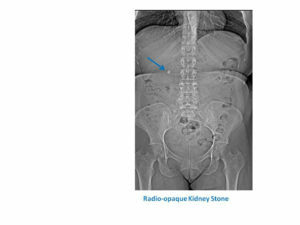 Stones that are located in the kidney can grow but rarely cause any symptoms. Most patients are unaware that they even have kidney stones. Pain typically occurs when the stone attempts to pass. 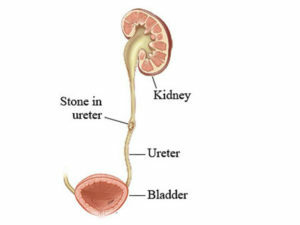 This means that the stone leaves the kidney and tries to travel down a narrow tube that drains the kidney termed the “ureter”. Ureteral stones can be excruciating. Depending on the size of the stone, the stone may or may not pass spontaneously. Often times, surgical removal of the stone is required. Stones can also form in the urinary bladder, especially in those patients who have difficulty emptying their bladder secondary to a large prostate. Treatment of kidney, ureteral and bladder stones involves both medical and surgical management. Consultants in Urology is proud to offer all the latest kidney, ureteral and bladder stone treatment options including laser lithotripsy technology. Dissolution: Uric Acid stones can be dissolved with oral medications. Uric Acid stones form in the presence of acidic urine (urine pH <6.0). By manipulating the urine pH to above 6.5 with medications uric acid stones can dissolve over time. Increase overall fluid intake. Goal should be drink enough fluids to urinate more than 2 liters of urine per day. Decrease protein intake. Excess protein intake can contribute to both uric acid and calcium based stones. Limit intake to 6-8 ounces of beef, pork, poultry or fish per day. Decrease salt intake. Excess salt intake can cause extra calcium to enter into the urine and thus lead to stone formation. Consume adequate calcium. Contrary to popular belief stone formers should NOT restrict their calcium intake. It is encouraged that you eat 2 servings of calcium rich foods daily. 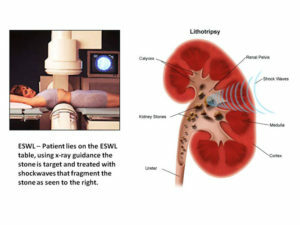 ESWL (Extracoporeal Shock Wave Lithotripsy): Indicated mainly for kidney stones smaller than 1-2cm. It can also be used to treat some ureteral stones. This is an outpatient surgery that requires no incisions or intervention. Under x-ray guidance and light anesthesia the stones are broken up into tiny pieces using shock waves (lithotripsy). These tiny stone pieces will pass in the urine over the next several days to weeks. 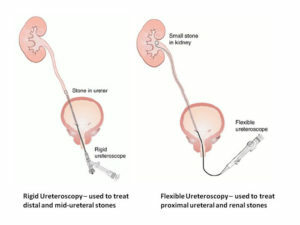 Ureteroscopic Stone Removal with or without Holmium laser lithotripsy : Indicated for ureteral and kidney stones. During an outpatient surgical procedure a small camera is inserted into your urethra, bladder and into the ureter (no incisions are required). Using the telescopic camera the stone is located and then either removed with a basket or fragmented with a laser. State of the art laser technology (laser lithotripsy) is used to shatter larger stones into tiny fragments, which are then removed. Percutaneous Stone Extraction : Typically indicated for patients with stones larger than 2cm. A small 1-2cm incision is made in the back. 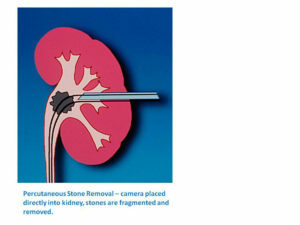 Through a telescope placed directly into the kidney the large stones are shattered using a combination of ultrasonic, pneumatic and laser technology. The stone fragments are removed. A tube is placed in the kidney for the few days and then removed. Open Stone Surgery: Almost never used in today’s modern stone era. By using a combination of the above modalities we almost never have to make a large incision to remove kidney or ureteral stones. Bladder Stone surgery: An outpatient surgery during which a telescope in placed into the bladder and the stones are fragmented using laser or hydraulic technology.